ASL Solutions Dog Palace Insulated Dog House can be your dog’s home away from home. It is actually the first manufactured insulated doghouse that uses real foam insulation for maximize protection against the weather. The house includes a self-closing insulated door for added comfort. With up to four inches of insulation and cross-ventilation, your dog will be comfortable in any kind of weather. This sturdy hardened plastic structure requires little upkeep and can last for several years. 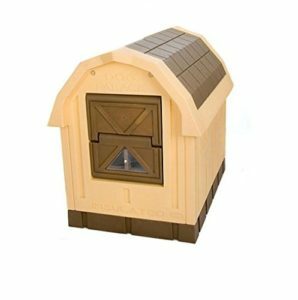 ASL Solutions Dog Palace comes in a traditional barn style with a peaked roof. A simple beige and brown style allows it to blend into any outdoor landscape. With a sloped floor and a drainage hole, clean up is a breeze. The floor is also raised off the ground for better insulation against those cold winter months. A viewing window allows your dog to keep an eye out on all the action in the yard and get added airflow when needed. 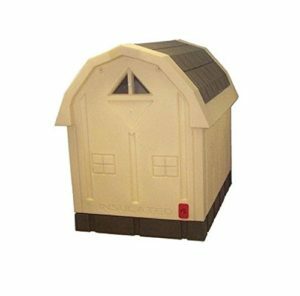 This dog house is made of durable polystyrene exterior material that is both sturdy and lightweight. Plastic doghouses require little maintenance. It cleans easily with a hose. The slanted floor and drainage hole facilitate the cleaning process. Plastic also tends to be mold and mildew resistant, reducing exposure to toxins and bacteria. 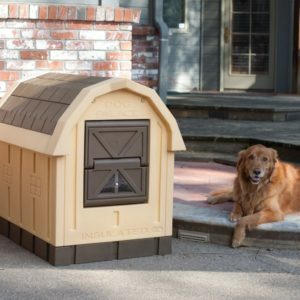 ASL Solutions Dog Palace is for medium to large dogs. Doorway for the ASL Solutions Dog Palace is 15.5”Wx 18”W, which fits most all breeds of large dogs. Many customers commented that the Dog Palace has plenty of room for a full-grown American Pit Bull or a 90-pound Labrador, as well as provides plenty of space for Italian greyhounds and other sleek and long dogs. The doorway of the dog palace is centered. Unlike other doghouses, the door is included in the purchase. It is removable for training purposes or extra ventilation. The door is approximately 11 inches from the ground, preventing drafts. The door is self-closing to prevent it from being left open in the cold weather, but it has a viewing window that can be easily opened by the dog to add ventilation and to use for sightseeing purposes. Even though the ASL Solutions Dog Palace is designed for medium to large sized dogs, the Dog Palace houses would be great for any small dog. The size of the structure can accommodate several small dogs in the same house. They would have plenty of room for stretching and playing. This doghouse is ideal for bigger-sized dogs such as Labradors, Italian Greyhounds, American Pit Bulls, and some German Shepherds. The foam insulation is useful for large dog breeds that tend to say outside in cold weather climates such as Saint Bernard breeds, bulldogs, yellow and black Labradors. Front and rear ventilation allows cooler air in while pushing warmer, staler air out. Ventilation panels allow you to close these vents during colder months. Extra ventilation, such as an exhaust fan, can be purchased separately. Nothing can be more frustrating than confusing assembly manuals. ASL Solutions Dog Palaces are simple and quick to assemble. Panels fit into grooves made in the flooring. This makes the walls fit tightly and prevents drafts. The lightweight materials mean no backbreaking work to assemble. Cleaning is just as easy. Remove wall sections and wipe down. The plastic can be wiped down with a cloth and some water, making clean up quick and hassle-free. Need some extra warmth during the coldest parts of winter? Want some more ventilation? ASL Solutions has just the accessories you need to spoil your four-footed friends. Cord fits through outlet hole in the back of the doghouse. This allows any extra cordage to be moved out of the house, preventing tripping and chewing. This works very well for short-haired dogs during the cold winter months. Placing a dog bed on top of the pad will provide greater warmth. For those humid days when the air is heavy, this may be a good solution. Pulls warm air out of doghouse while pulling fresh air through the front vent. The fan also comes with an 8-foot cord. This is ideal for cloudy days or shaded areas. 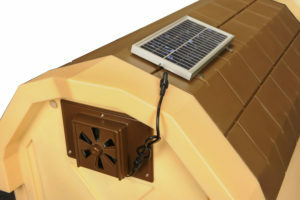 It comes with four screws for attaching the solar panel to the doghouse. As a dog owner, customer reviews on dog products can give tremendous insights. The ASL Solutions Dog Palace customer reviews are very positive. Dogs can be rough on their things, doghouses included. Many customers commented on how durable it has been over the years. This speaks volumes about its construction. Most ASL Solutions Dog Palace customers seemed impressed with the climate control. This is from the well-insulated walls and the cross-ventilation. Dogs stayed comfortable in the most humid summer months and toasty warm in the coldest of winters. It is always good to find a doghouse for large breed dogs. Buying doghouses for smaller dogs has always been much easier to find. Having a Saint Bernard, I can relate to many customers. I was pleasantly surprised to find one that could easily accommodate the size of the largest dogs. You can read more from ASL Solutions Insulated Dog Palace customers here. Price is always a determining factor, especially for large purchases. 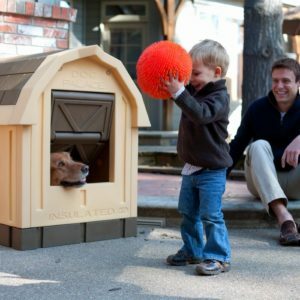 Although more expensive than other doghouses, I would consider this a wise investment. Its durability alone will save you from buying replacement houses or parts, as this doghouse can last for years. The solar powered exhaust fan will save money from high electric bills. It is a great accessory to have for any “green” family. 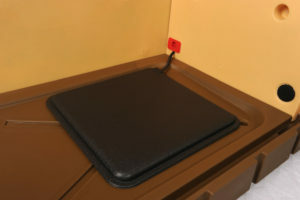 Additional accessories such as bedding and makeshift insulation are not needed for this unit. As a result, you will probably save money. Sloped floor with drainage hole allows for easy cleaning. Raised floor for added warmth during cold weather. Installed insulation for added protection against weather elements. Self-closing door to keep out heavy rains. Viewing window for dogs to stick their head outs and see the world. Easy assembly means less time putting it together. It also allows easy access to interior for cleaning and wiping down. Plastic construction means your dog palace will last for years. No shingles or boards to replace like traditional wooden doghouses. It is also mold and mildew resistant, making it very pet-friendly with reduced exposure to toxins and bacteria. Front and back ventilation allows air to circulate freely. Ventilation can be closed with panels during cooler weather. Dog floor heating pad accessory provides greater warmth in frigid winter months. Solar powered exhaust fan is an efficient accessory. Using the power of the sun, this fan will increase air circulation for humid days. Great home for large outdoor breed dogs like the Saint Bernard or Italian Greyhound. 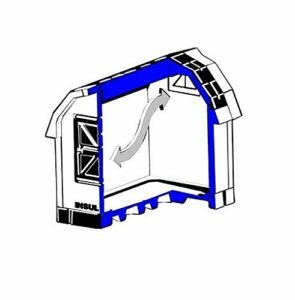 While this doghouse is lightweight and mobile, due to its strong construction and insulation, you will find little need to move this doghouse from place to place. It can withstand the elements and heavy rains much better than houses with no insulation. The price for your ASL Solutions Dog Palace is about double the price of the more traditional, simple wood-frame dog shelters. Costs increase to about triple the price if you want to add heaters or fans. So, this purchase is an investment that you will want to utilize for a long time. These doghouses are not as stylish as the wooden ones with fancy decks and shingled roofs. Like many dog owners, I have searched the Internet for good dog products and researched everything from “indestructible” toys to flea treatments to doghouses. Some, I admit, were not worth the second look, much less the price. I really cannot find anything bad to say about this dog palace. It lives up to its name when looking at all the positive points. Normally, I don’t bother with the accessories. It is often much cheaper to find more suitable ones. But both accessories for this doghouse are worth looking over. We have very little shade so the solar powered exhaust fan will work well for us. The heating pad will work great for our older, smaller dogs. Both have arthritis. The heat from the pad will make them more comfortable during our cold New York winters. Overall, the ASL Solutions Dog Palace is a wise investment for dog owners that want to keep their large dogs comfortable year around. Amazon puts a lot of time and money into keeping their pricing competitive. At the time of writing this review, the price was really attractive and they had free shipping.